If you enjoy sweet, tender romances, grab our "Lost In Love" box set series. 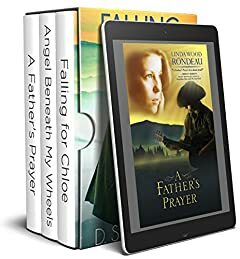 A Father's Prayer by Linda Wood Rondeau â€” Ethan only wants to be with Gibâ€”to love the boy he's never known. But his presence only seems to complicate the childâ€™s life. Letting go of the son you never had may be the hardest sacrifice a father can make. Falling for Chloe by D. Stearman â€” Jake expected fame to take its toll. He just didnâ€™t realize how much heâ€™d have to give up in the pursuit of stardom. But the hardest thing? Losing Chloe, his small-town girlfriend and the only person who knows the real Jake. Angel Beneath My Wheels by K. S. Moore â€” Maybe she was his good luck charm ... an angel beneath his wheels. Now Luke's gentle ways and country charm may win her over â€” if his past doesn't push her away.